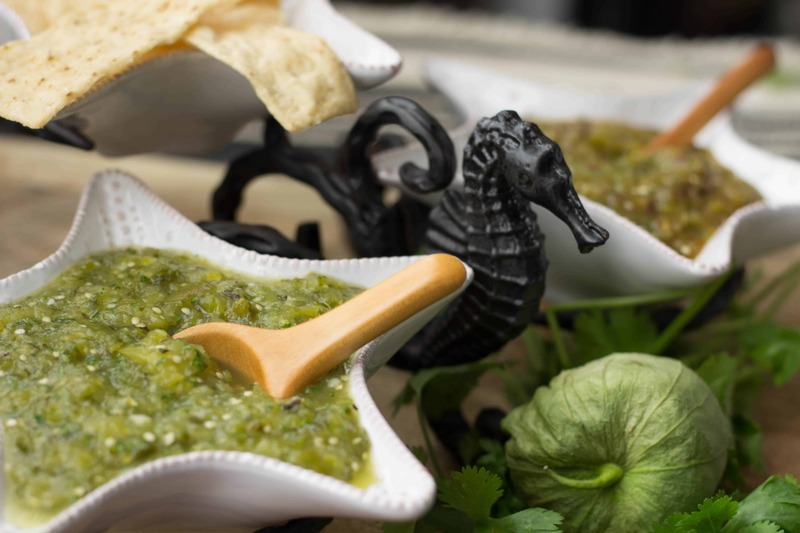 I’ve been making this tomatillo salsa for years. It was in one of my previous cookbooks, Entertaining with Amy (definitely not a smart point friendly cookbook and thus the reason I ended up joining Weight Watchers). It’s great with chips, over enchiladas, and in my Chipotle Cilantro Dressing. It’s mild but you can make it hotter if you use this as a base and add 1-2 finely chopped chipotle peppers (look at far salsa in background, it’s a little redder in color-that’s the Spicy Tomatillo Salsa). I usually make this and divide it in half and use the other half for the Spicy Tomatillo Salsa or for the Chipotle Cilantro Dressing. You can freeze whatever you don’t need right away for another day. If serving it with chips however, I think it tastes best fresh, not frozen. 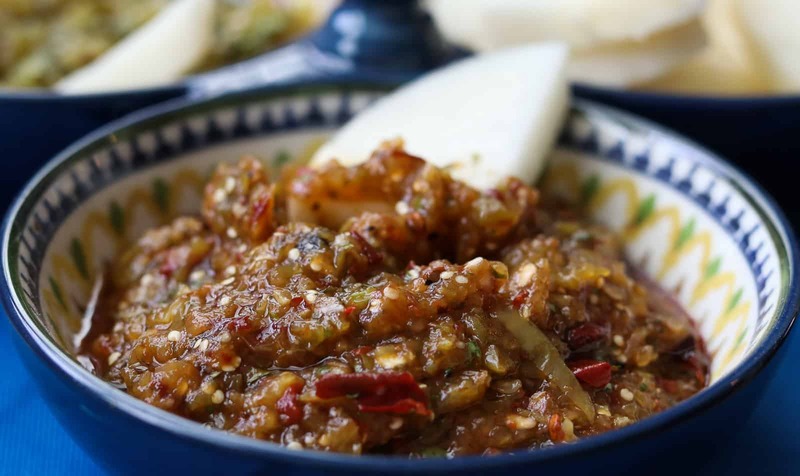 You can turn the Tomatillo Green Salsa into a spicy Red Salsa by adding a few chopped chipotle peppers in Adobo sauce. I like to serve both at a party. Make the green, then save some to make the red. I do like it fresh best, but you can freeze it as well. 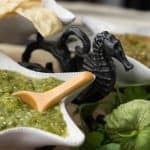 I’ve been making this salsa for years. It was in one of my previous cookbooks, Entertaining with Amy (definitely not a smart point friendly cookbook and thus the reason I ended up joining Weight Watchers). It’s great with chips, over enchiladas, and in my Chipotle Cilantro Dressing. It’s mild but you can make it hotter if you use this as a base and add 1 -2 finely chopped chipotle peppers (look at far salsa in background, it’s a little redder in color-that’s the Chipotle Salsa). I usually make this and divide it in half and use the other half for the Chipotle Salsa or for the Chipotle Cilantro Dressing. You can freeze whatever you don’t need right away for another day. If serving it with chips however, I think it tastes best fresh, not frozen. Soak the tomatillos in water to help remove the husks. Cut tomatillos, jalapeno and poblanos in half and place on a foil lined baking sheet. Broil about 8 min until slightly blackened. Cool. Remove skins of poblanos and jalapeno. In a food processor, combine tomatillos, jalapeno, green chilies, poblanos, onion, cilantro and garlic. Process until smooth. Refrigerate until needed. Keeps about 5 days in refrigerator or you can store in freezer safe containers in the freezer until needed. No Replies to "Tomatillo Green Salsa"
Welcome to my kitchen! Deliciousness for life! I’m Amy Lawrence. Welcome to my blog about skinny gourmet recipes for life! I’ve been in the food and tea industry officially since 2003 (unofficially since the day I was born). I’m a Weight Watcher for life! More about me and my journey…. How to Use the Instant Pot- Help! I’m scared! Looking for help with the Instant Pot? Scared to death to try it? Check out my post and video! Be sure and fast forward the first 3 minutes. Check Out My Weight Loss Pictures! If you think eating healthy means bland food, think again! 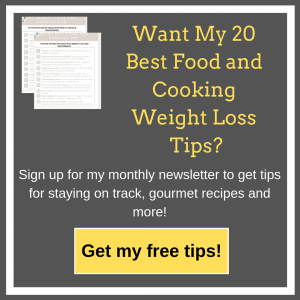 You can eat tasty healthy gourmet food with my recipes! The recipes I’ve created help me stay trim! Check out my Gourmet Done Skinny Facebook Group! This is a closed Facebook group for people who love to cook, want to lose or maintain their weight by eating gourmet healthy recipes. We are about helping others on their weight loss journey by providing tips, suggestions and discussion. Amy Lawrence on Need a great mixer? Check out my new Nutrimill Artiste Mixer! chain on Need a great mixer? Check out my new Nutrimill Artiste Mixer!